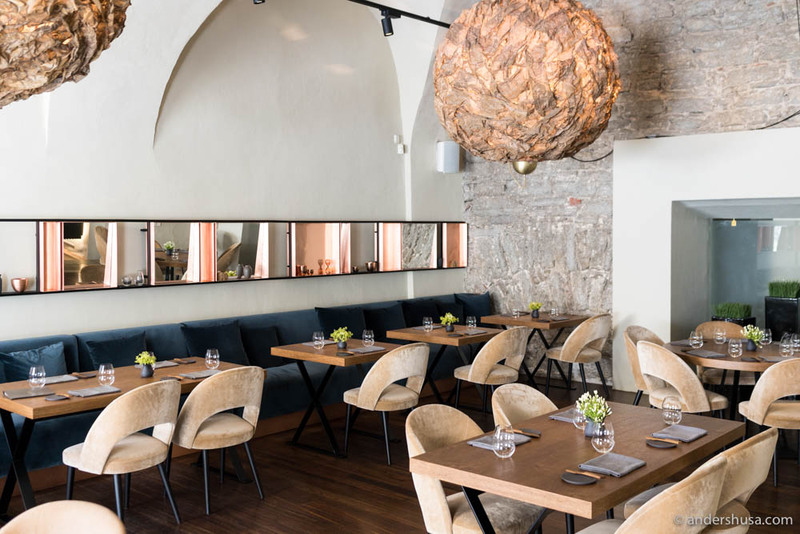 Restaurant ORE is my favorite eatery in the city center of Tallinn. 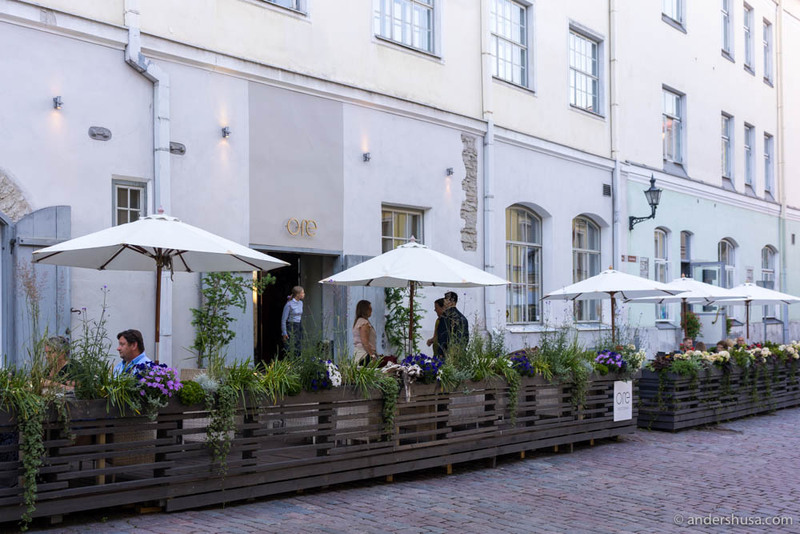 Specifically, the place is located in the most beautiful part of the Old Town, where a lot of the buildings are still untouched by modern alterations. 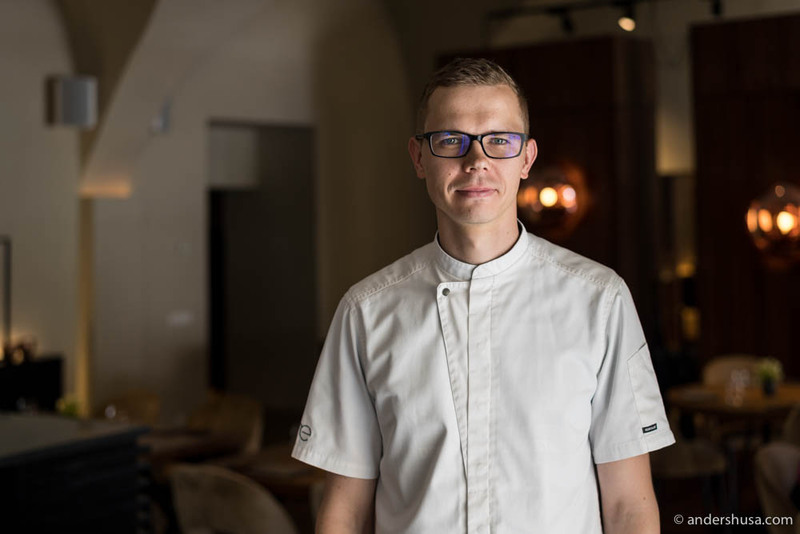 Head chef Silver Saa has experience from top restaurants in London (The Savoy Hotel), Copenhagen (Bror), and Helsinki. 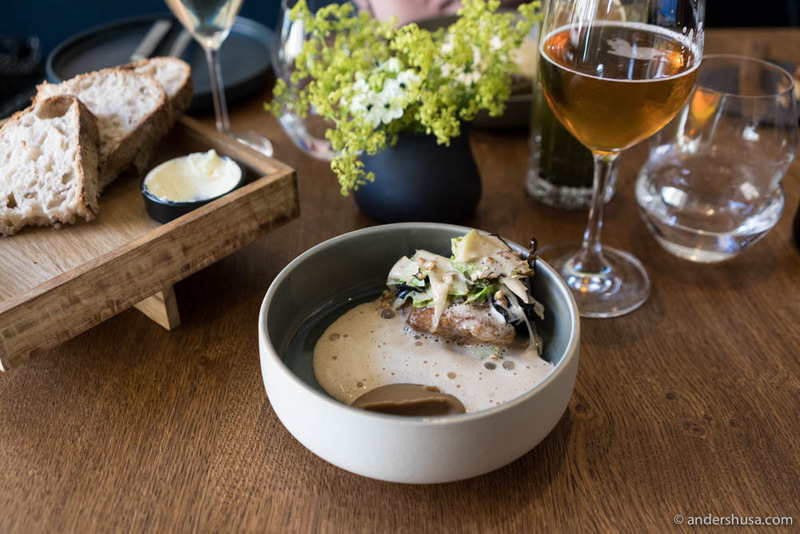 Before he took over the kitchen at ORE, he worked at another restaurant in Tallinn – Salt. 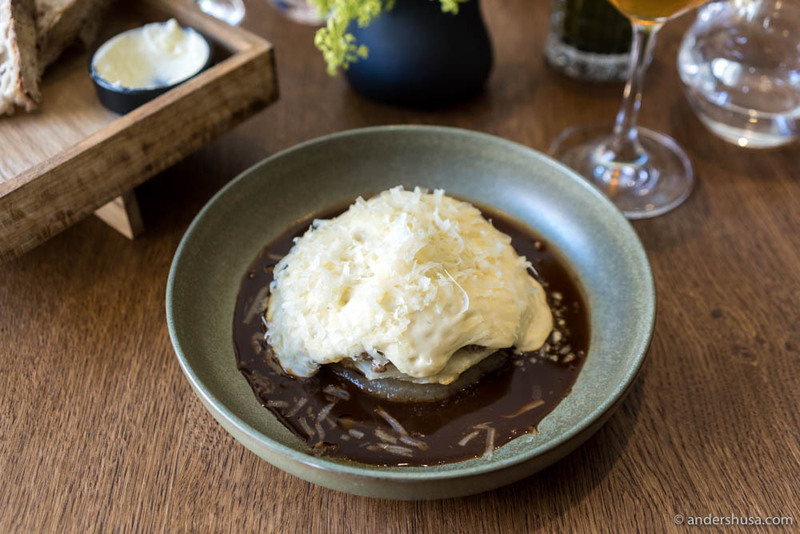 His international influence is evident in his cooking, where he mixes Japanese, Latin-American, and Nordic flavors and techniques. 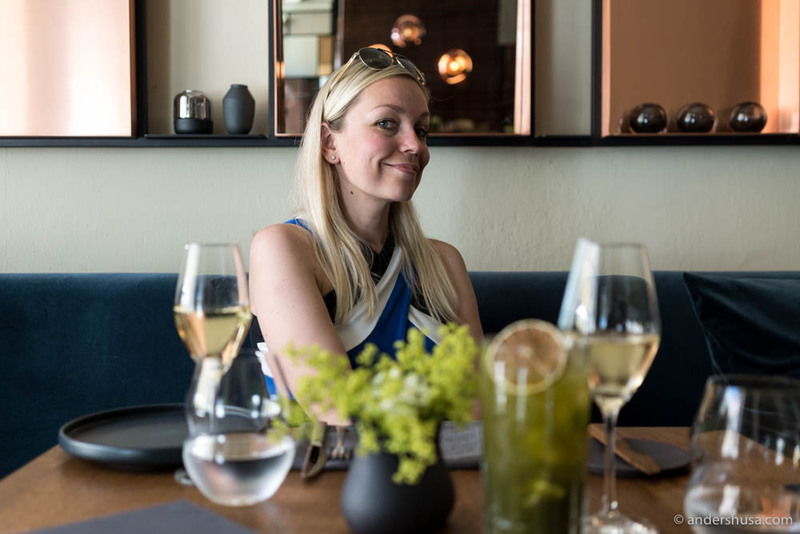 I went here for a lunch with my good friend Triin, who runs the newly-opened restaurant Noya in Tallinn, and we enjoyed an almost flawless menu. 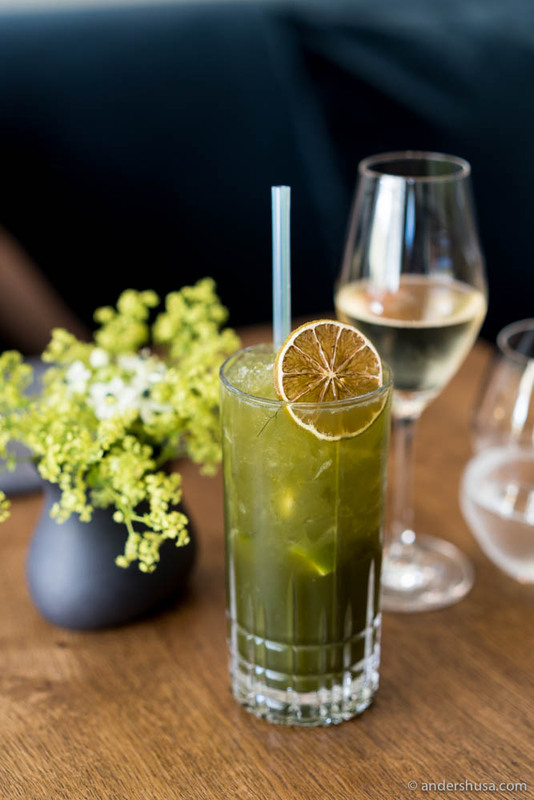 We started with a refreshing apéritif made with fennel syrup and presented in a highball glass. ORE’s sourdough bread arrived at the table as well. A crispy crust that crunches between your teeth as you bite into it – contrasted by an airy and stretchy inside. Just what I want from a good homemade bread. 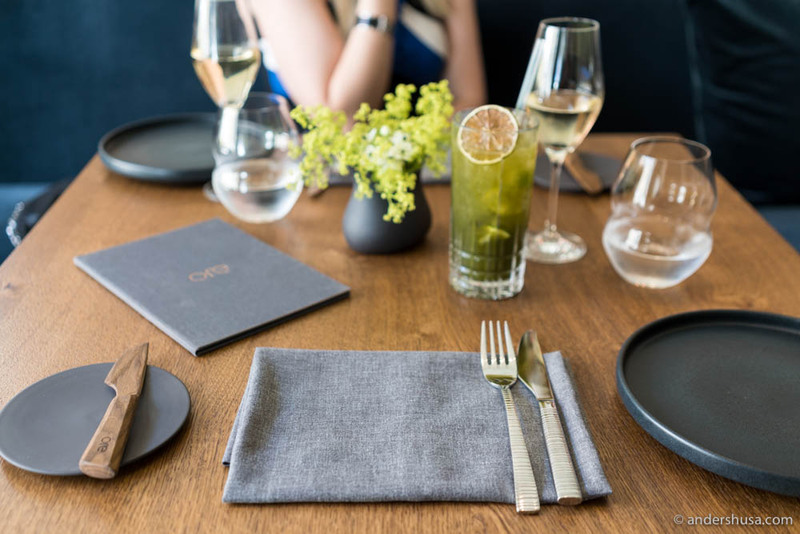 ORE does offer a tasting menu (€45), but we chose from the à la carte menu for lunch. Mainly because we were tempted more by the snacks, and less by the mains and desserts. Snacks cost €7-8, starters €9-15, mains €16-24, and desserts €7. Shiso leaf tempura with salted mackerel & yuzu was the first snack and possibly my favorite dish from the meal. 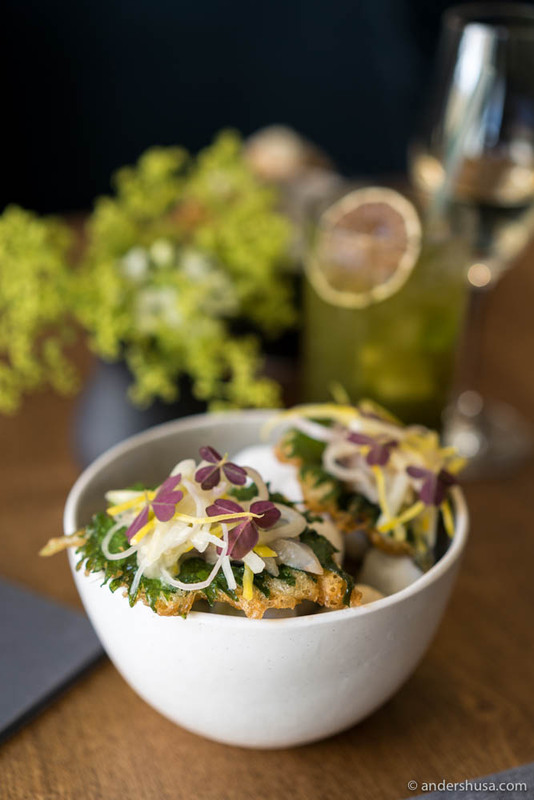 A tempura-fried green leaf (batter only on one side) topped with delicate pieces of sliced mackerel, fresh radish, red oxalis, and shavings of yuzu zest. Refreshing and pure flavors in a great presentation. 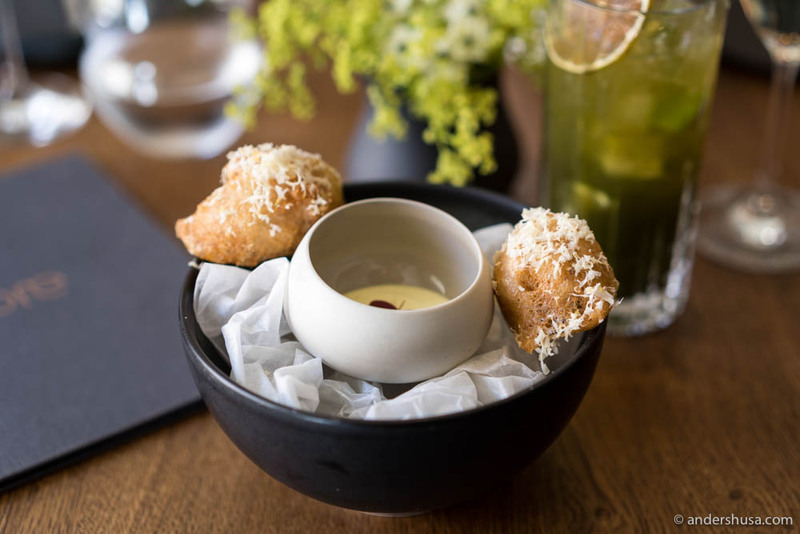 Another delicious snack of veal brain tempura topped with horseradish came with a tarragon cream to dip in. Scared of eating brains? Don’t be. It’s creamy, fatty, and oh-so-light and tasty. 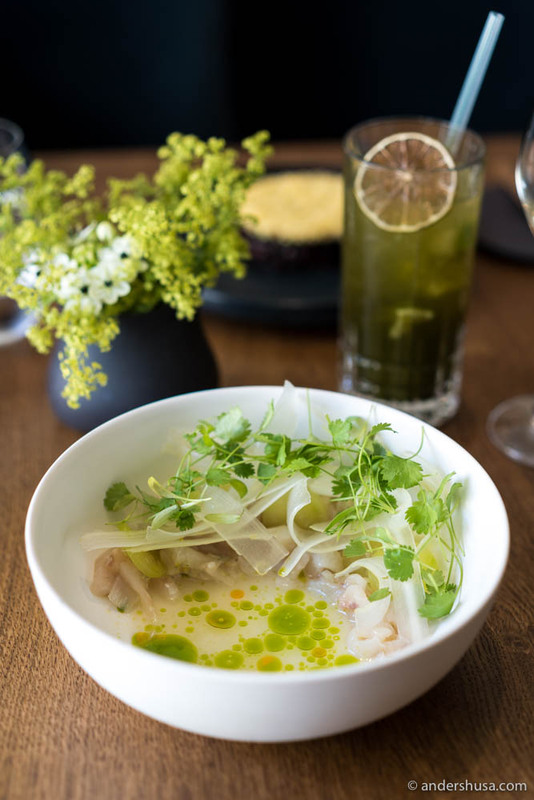 With a seabass tiradito, Saa demonstrated that he also masters South-American flavors. Cold pieces of sliced fish, crispy strips of daikon, tiger’s milk and cilantro was elegant and clean in its flavor with a slight sting. 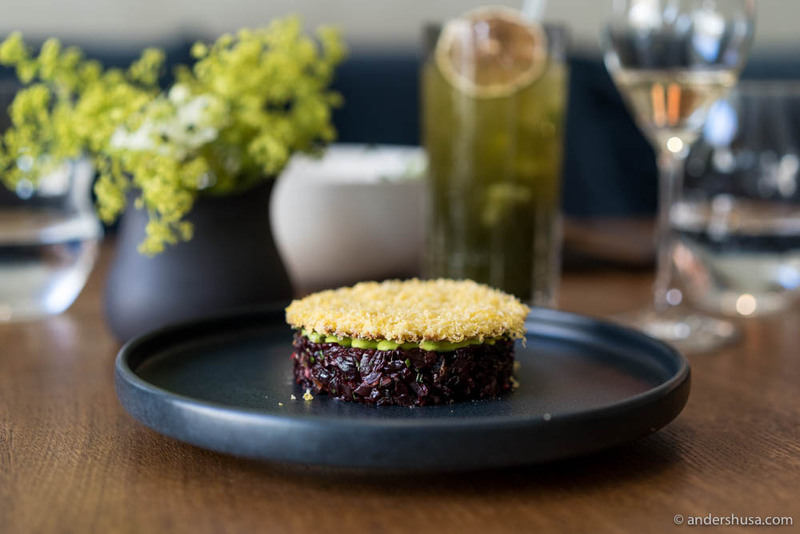 I was really looking forward to the beets tartare – a dish I love when done right. Unfortunately, this was the biggest disappointment on the menu. The beets were dehydrated but had an odd flavor. Apparently, they had been cured in a red wine sauce for reasons I cannot understand. The presentation was great, however, with a layer of wild garlic emulsion, shiso leaves, and shaved salted egg yolk on top. It just didn’t please the taste buds as much. 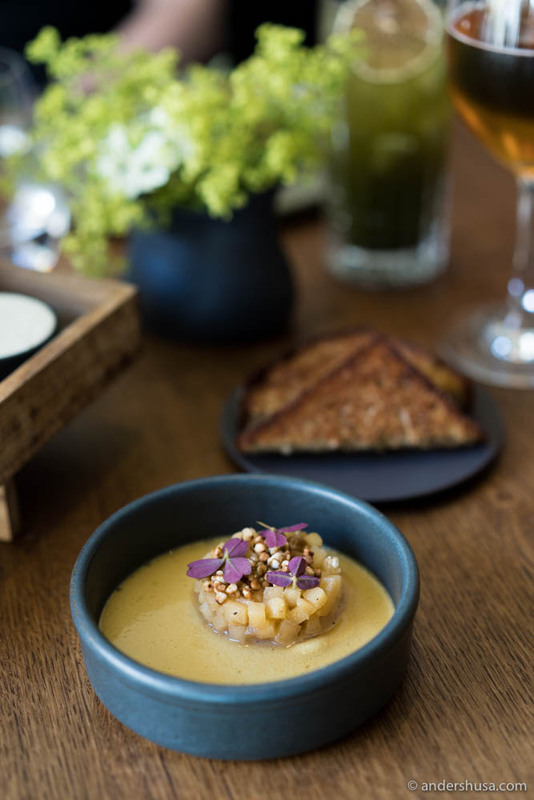 A foie gras parfait with apples, red oxalis, and brioche made the day bright again. What’s not to love about this flavor combination of salty, fatty, and umami-rich liver with sweet and acidic apples? Add butter-fried brioche for the crunch and even more balance in taste and textures. 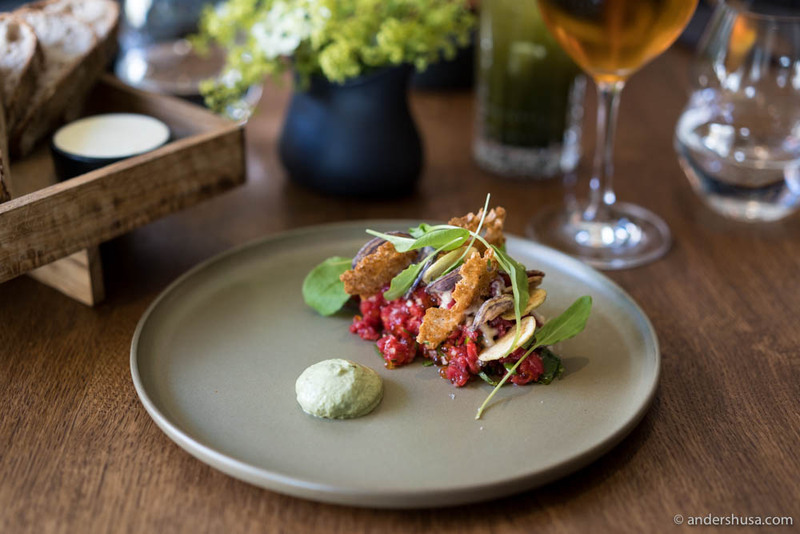 Silver’s beef tartare came with trout roe, a bonito emulsion, crispy bread, and sorrel. I would have removed the trout roe and added more salt to the bread chips instead. What the last two dishes lacked in presentation, they made up for in flavor. Pan-fried veal sweetbread came with trumpet mushroom, a teriyaki sauce, and cabbage, and looked … well, brown. Roasted celeriac, with a brown butter sabayon, preserved pear, and celeriac jus looked like a complete mess on the plate, but my goodness did it taste good. 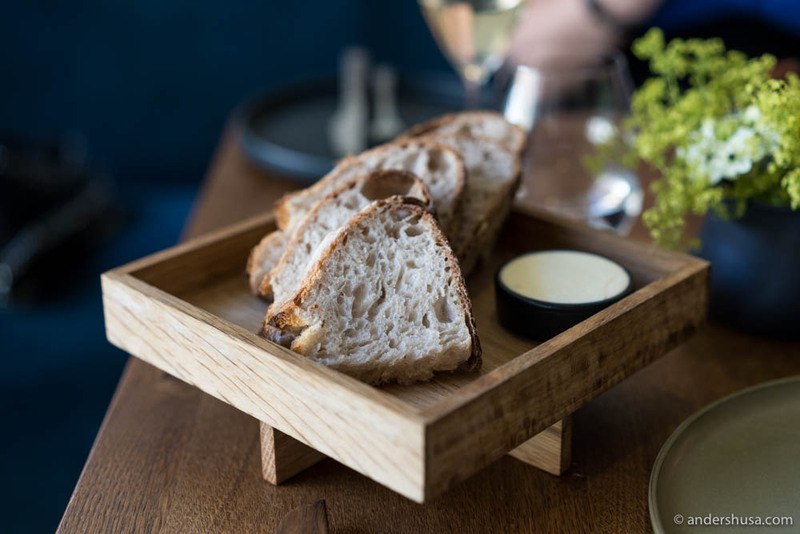 As long as you got some of the brown butter sabayon in each bite to balance the sweetness. 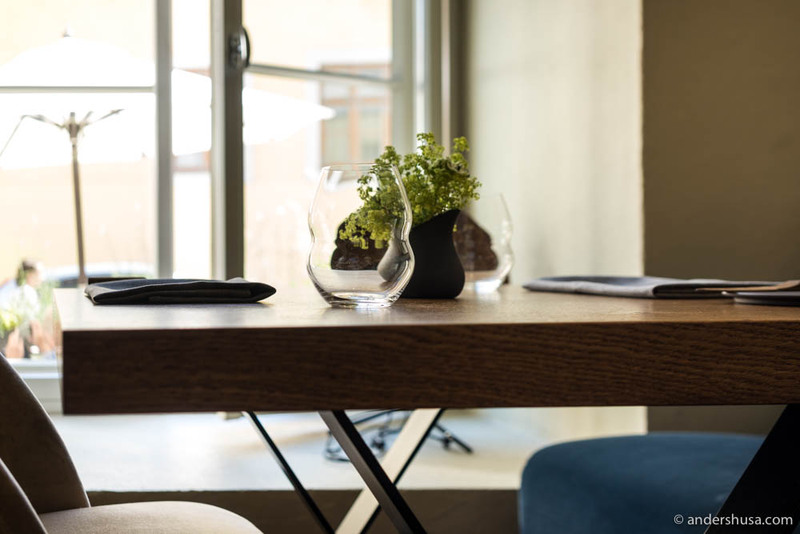 ORE is a restaurant I’ll be paying close attention to and revisit at the first opportunity. This visit was sponsored by Visit Estonia. Funded by the European Union European Regional Development Fund. They had no influence on my selections, neither of the places I chose to visit, nor which ones I decided to feature in the end.